"The Franklin Maxwell Group contract workforce possessed the expertise and background to produce every product on time, if not ahead of schedule. They understood the dynamic nature of the work and were able to anticipate and respond to changing priorities"
Franklin Maxwell is committed to client satisfaction. An independent Dun & Bradstreet past performance evaluation rated Franklin Maxwell 97 on a scale of 100 covering nine critical performance evaluation areas: Reliability, Cost, Order Accuracy, Delivery/Timeliness, Quality, Business Relations, Personnel, Customer Support and Responsiveness. At project initiation, the Naval Criminal Investigative Service (NCIS) was organized into two major directorates, one with overall responsibility for the operational mission of the organization and the other with responsibility for the full range of management and administrative support functions. Franklin Maxwell was engaged to provide management consulting services in the comprehensive review and assessment of the broad administrative organization encompassing financial management, information technology, facilities management, contracting and procurement, records management, logistics, security, civilian human resources, military administration, and administrative services. 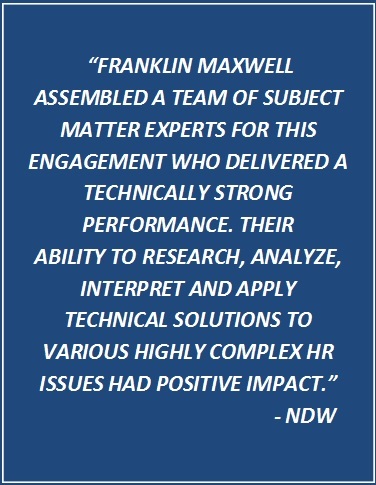 The Franklin Maxwell Team members participated in the review and assessment of each of these functional areas, offering both technical expertise and extensive experience with Department of the Navy mission, functions, and organizations. The Team supported the implementation planning and execution of the resultant organizational transformation, which included project management, policy development, risk management, management and workforce training, process evaluation, web-site development, and management information system planning and implementation. They identified functional requirements; outlined functional responsibilities, primary and secondary roles and cross-cutting issues between the support organizations reporting to the Deputy Director for Management and Administration; and recommended organizational alignments in order to maximize efficiencies, enhance management controls, and improve organizational effectiveness. The Franklin Maxwell Team provided expert advice and guidance to NCIS senior management on all aspects of Human Capital Management. We facilitated the development of an NCIS Strategic Human Capital Plan, including Vision and Mission statements as well as the identification and assignment of goals and objectives in support of the Plan. Our Team also advised the executive management team on the optimum structure, process, and timelines for National Security Personnel System (NSPS) and Defense Civilian Intelligence System (DCIPS) pools, as well as on strategies and procedures required for the program’s success. Our Team engaged stakeholders and established partnerships to facilitate the transition of NCIS to a performance-based organization. To ensure project integrity and completion of milestones, we tracked NSPS and DCIPS project status and reported milestones to client leadership. We coached and mentored NCIS managers, supervisors, and employees and provided help-desk responses to employees, including all issues surrounding the use of a complex automated performance management tool. Furthermore, we drafted policies, business rules, and SOPs governing the operations of both personnel systems. Franklin Maxwell had been tasked with providing expert advice, interpretation, and consultation on Title 5 United States Code, Office of Personnel Management, Department of Treasury, and Mint specific policies and programs in the functional areas of Human Capital Policy, Employee Relations, Labor Relations, Staffing, and Position Classification. Franklin Maxwell has provided expert policy advice and guidance to senior managers and assisted in the development and implementation of Human Capital policies and internal guidance memoranda. Our team researched and drafted revisions to a variety of Mint policies including the Mint's merit promotion plan; position management policy; employee medical records policy/procedures; professional liability insurance policy; and category ranking procedures. We benchmarked Federal agencies and industry best practices with respect to new employee orientation processes, as well as the use of assessment centers and promotion tests. We assisted management and leadership in identifying short and long-term objectives and formulated recommendations and proposals in order to accomplish the agency mission and performance goals. In addition to supporting the staffing and classification program areas, we served as a resource for executives and managers in Labor and Employee Relations (LR/ER) matters and provided technical advice on a wide variety of highly complex and potentially sensitive LR/ER problems and issues. We served as the Mint’s LR/ER expert at the headquarter level in reviewing casework initiated from field Human Resources Offices across the United States. Our consultant staff demonstrated a high degree of judgment and originality in solution recommendations based on their comprehensive knowledge of Federal Employee Relations theories, principles, and practices. Franklin Maxwell provided Human Capital Management and Project Management services to the Naval District Washington for over four years. We supported the Human Resources Office, Washington (HRO-W) in a variety of HR functional areas and programs including: policy development, staff competencies, organizational performance, recruitment and staffing, position classification, employee relations, labor relations, equal employment opportunity, and employee assistance. We actively assisted HRO-W customers with complex Merit System Protection Board pleadings, arbitration briefs, settlements and alternative discipline agreements; processing unfair labor practice charges and negotiating third party settlements; mediation in the settlement or prevention of labor disputes connected with the formulation or renewal of collective-bargaining agreements; interfacing with legal staff, union representatives, and outside agencies; and conducting investigations into complex and sensitive HR issues. Additionally, Franklin Maxwell provided program management and employee assistance counseling services to approximately 4200 employees and their dependent family members in DC, MD, and VA.
Franklin Maxwell also provided program management services in support of the Naval District Washington Joint Basing initiative to centralize installation management functions at Naval Support Facility Anacostia and Bolling Air Force Base. We coordinated various aspects of the Joint Basing effort, developed and analyzed project requirements, created a Plan of Action and Milestones and an Integrated Project Plan, monitored and evaluated progress and quality, established standard operating procedures, prepared reports and briefings, and interfaced with senior leadership. Furthermore, we facilitated functional work groups and worked with functional leads in developing and designing effective organizational structures; resolving unique organizational requirements and issues; assisting in determining which positions were mission critical; ensuring sound position management practices were followed; and assisting in developing and drafting positions descriptions. Furthermore, we provided support in developing and implementing recruitment strategies for filling vacancies.